Alliums are perennial flowers that stand very tall, towering over your other flowers. 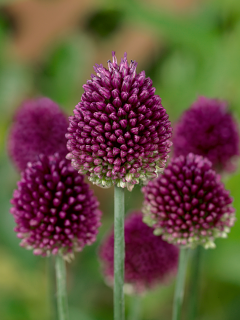 Alliums are also known as Ornamental Onions due to their odour and taste (in bulb form). They are often described as lollipops or fireworks due to their spherical appearance. Alliums should be planted in the Autumn for later Spring flowering. Alliums are a real show stopper for your garden. They are ideal for full sun or partial shade and create a great feature whatever the location. Please note, our Alliums are sold in packs. Please check the quantity you enter, 1 = 1 x PACK of Bulbs. Varieties may differ in pack size. Wow - what a show stopper. This variety of Allium called Red Mohican will definitely stand out from the crowd.